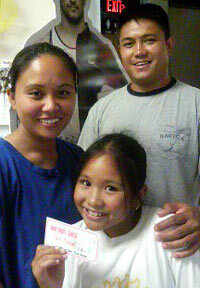 Wenonah Ebreo is this week's winner of the Y5,000 gift coupon to Esthetic Salon Come Across. She is originally from Reseda，California, and has been on Okinawa seven months. Read More! The question often asked in today's social settings is whether you've 'Got Ink?' Tattoos and body piercing have become part of today’s fashion, and people are get tattooed as a way of expressing their individuality. From memorial tattoos symbolizing military service to original art, the possibilities are endless. Read More! 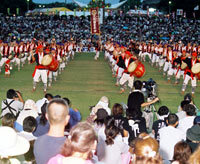 It's official event name is the All-Okinawa Eisa Festival, but most everyone in Okinawa knows it as the Orion Beer Festival, running Saturday and Sunday at Koza Sports Park in Okinawa City. A better way to describe the festivities at the 52nd annual festival is fun in the sun, mixed with beer, music and lots of eisa dancers. Read More! Finally, a day care center that really takes youngsters under its wing and teaches as well as baby sits. 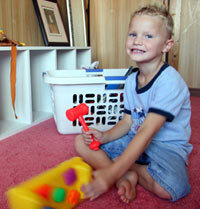 Baby123 is unique, offering bilingual, multi-cultural experiences for its young clients. Read More!